In the United States, one of the most commonly seen nutritional deficiencies is iron deficiency. Women are at the highest risk of developing iron deficiency, especially those who are during menstrual periods, pregnant, breast feeding, or female athletes, babies or toddlers, and teenagers. Iron is a part of cells and plays a very important role in producing hemoglobin which helps the red blood cells deliver oxygen from the lungs throughout the body. Iron can also help muscles restore and use oxygen. Iron deficiency is a condition in which too little iron is in the body. If left untreated, a person who has iron deficiency will have too little hemoglobin in the body and gradually develops iron deficiency anemia. What Are Iron Deficiency Symptoms? A lack of iron can affect many parts of our bodies. When iron is low, less oxygen will be delivered throughout the body, resulting in the following signs and symptoms. There are times in which you will feel tired. 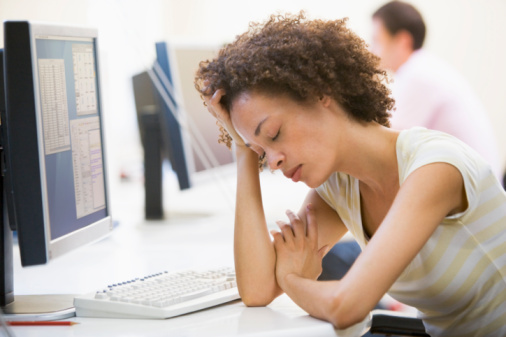 However, fatigue is one common iron deficiency symptom. Fatigue often increases when you do not get enough sleep. You even cannot do your normal workout or keep yourself focused at work and you are often irritable. Your skin will be pale when iron is low because the body's red blood cells are not receiving sufficient oxygen. You may find that the inside of your lips are even pale because there is not enough oxygen and blood getting to the skin to give it a pink rosy color. This occurs because the body is not getting enough oxygen. If you notice that you can no longer walk a flight of stairs or do normal routines with shortness of breath, you may have iron deficiency. If you notice some symptoms such as irregular heartbeats, heart enlargement, heart murmurs or even heart failure, the underlying cause may be iron deficiency. When the red blood cells are not functioning as they should be, the heart will work harder to use the oxygen that it is getting. Since there is a low amount of oxygen in the body due to iron deficiency, the brain does not get as much oxygen as it should. This can result in headaches because of swelling arteries that do not get a sufficient amount of oxygen. When the body is receiving less oxygen, it will go into the flight-or-fight response most of the time. This can cause more anxiety than you would normally have, even though there is no reason for some of these feelings to occur. Since the body is running low on oxygen, hair loss may be a clue that you could be low on iron. When there is enough oxygen for the body, it will try to keep the hair healthy. Thus, losing your hair is one of the significant iron deficiency symptoms. Those who have been diagnosed with iron deficiencies often complain of a sore tongue. Low iron counts will reduce the levels of myoglobin which supports the health of muscles such as tongue. As a result, you may complain of an inflamed, sore and very smooth tongue. If you has low iron in your body, your nails will become very brittle. Visible signs are dents or spoon-shaped depression in these brittle nails. If you often get sick, especially respiratory illnesses, iron deficiency may be the underlying cause for these infections. Other symptoms may include cold hands and feet, lightheadedness or dizziness, unusual cravings for ice, starch or dirt, poor appetite and restless legs syndrome (a crawling or tingling feeling in legs). If you think that you or your child may develop iron deficiency symptoms, see your doctor. This is not something a person can self-diagnose or treat, as there could be other underlying issues. Excess iron accumulation in the body can damage you or your child's livers and cause other medical conditions. If you do not eat enough foods that contain iron such as leafy greens, meats, eggs and iron-fortified foods, you will find that your diet could be to blame for iron deficiency. Since iron is found in red blood cells, chronic blood loss could cause low iron, such as menstrual cycles, regular nosebleeds and blood donation. In addition, bleeding ulcers and other internal bleeding can cause iron deficiency. Regular use of some OTC pain relievers such as aspirin can cause gastrointestinal bleeding which may result in iron deficiency. Iron is absorbed from food by the small intestine. For people who have an underlying issues with their small intestine, this can lead to no or poor absorption of the iron. This can also happen when the small intestine has been partly removed or altered surgically. There are times in which a body needs to have an increased amount of iron in order to function properly. This can be seen in pregnant women, women who are breastfeeding or children who are going through growth spurts. A pregnant woman's body has to support the fetus and her own as well. Due to this, many pregnant women do not get enough iron to support both bodies, which leads to iron deficiency. In addition, athletes often need an increased dosage of iron because regular exercise can promote the production of red blood cells, while a high level of perspiring makes iron lost from the body. When low iron is present and the diet is the cause of iron deficiency, most doctors will recommend eating more iron-rich foods, such as leafy vegetables, beans, fish, white or red meat, brown rice, beans, nuts, seeds, eggs, tofu, iron-fortified cereals or bread. You should include foods from all major food groups in your diet to ensure it is well-balanced. In addition, vitamin C can help the body absorb iron. So you should also eat foods that are rich in vitamin C.
Before taking any iron supplements, consult your doctor about the dosage you require to keep iron at the proper level. When taking iron supplements, you may be instructed to take them on an empty stomach for better absorption. However, you may also take them with meals in order to prevent an upset stomach. Iron supplements can also be taken with vitamin C by drinking them with orange juice to help the absorption of the iron. The iron should not be taken with medications for heartburn because it may not be absorbed by the body.